New York in the ’60s, ’70s and ’80s was un-soiled by gentrification and alive with the energy of sexual, activist and artistic revolutions. It was an embarrassment of riches to photographers talented enough to know what to do with it. The disco crowd drew in Bill Bernstein and Bobby Miller; Diana Davies focused on the queer movement; Richard Sandler looked at life in the subway; Joe Conzo, Janette Beckman and Martha Cooper, the hip-hop scene; and Peter Hujar, a cultural underground that would attain legendary status. Hujar was one of photography’s rebels, the creative love child of the weird Diane Arbus and another underground community photographer, Nan Goldin. He attempted a mainstream magazine career early on but discovered it wasn’t what he wanted. Hujar had to march to the beat of his own drummer. The fame of his subjects eclipsed his own at times; still, he should be remembered for more than just taking some cool pictures of cool people. He helped loosen up the art form, challenging portrait photography in the same way some of his subjects challenged the art forms they were working in. Just think of getting your portrait done at a studio or taking a photo of yourself for Instagram. What do you envision? Getting all dressed up, wearing make-up and smiling? Staring straight at the camera? A Hujar subject might appear to be sleeping, or just getting up, or, as in his photos of Susan Sontag, Peggy Lee or Charles Ludlam, lost in thought. Susan Sontag, 1975, gelatin silver print, purchased on The Charina Endowment Fund, The Morgan Library & Museum, 2013.108.8.2310. © Peter Hujar Archive, LLC, courtesy Pace/MacGill Gallery, New York and Fraenkel Gallery, San Francisco. As the museum explains, a “reclining portrait” was “a genre of photograph Hujar made his own.” Hujar captured Ludlam, a theatrical pioneer, out of drag, looking away from the camera, in a corner of a room, likely his Morton Street apartment. Hujar isn’t photographing him like a photojournalist out to capture “the wacky avant-garde.” We feel like we need to take Ludlam seriously. There is also an after-hours feel. Perhaps it is the end of a very long day. Hujar appeared to have a deep respect for his subjects, an understanding. His photographer status meant he was outside the community, but he was also one of them. Self-Portrait Jumping (1), 1974, gelatin silver print, purchased on The Charina Endowment Fund, The Morgan Library & Museum. © Peter Hujar Archive, LLC, courtesy Pace/MacGill Gallery, New York and Fraenkel Gallery, San Francisco. 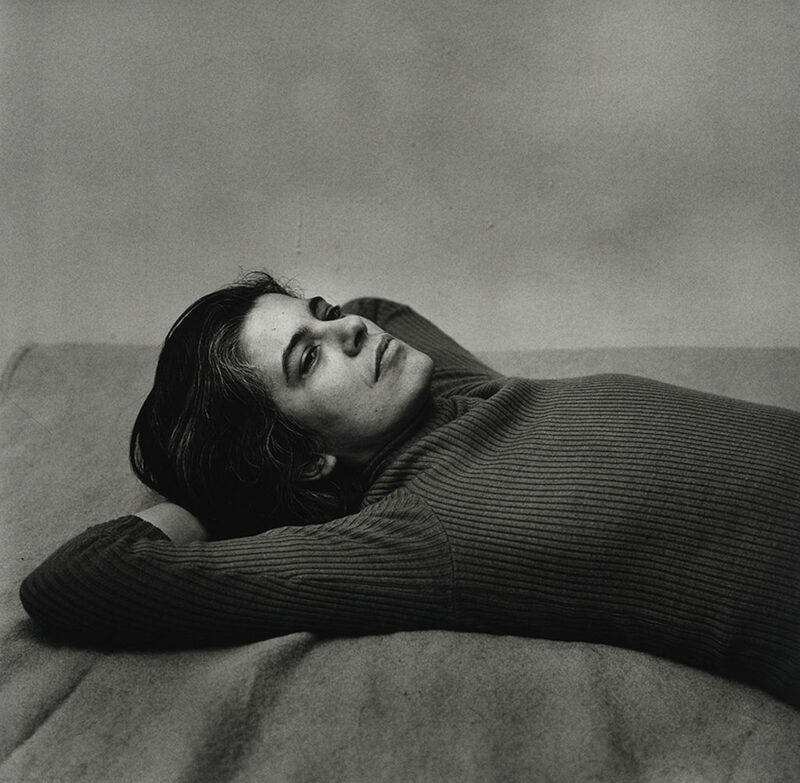 Fran Lebowitz trusted Hujar enough to let him photograph her under a bed sheet (or perhaps a couple) at her then-home in Morristown, New Jersey. Looking grungily seductive, she was a few years away from the publication of Metropolitan Life, but already writing for Andy Warhol’s Interview. I don’t think Lebowitz has allowed herself to be photographed appearing so vulnerable since. She looks at us confidently, in front of wallpaper that’s as 1970s as it gets. In Hujar’s world, you were allowed to look less than camera-ready, but still seem sure of yourself in simple, serviceable black and white. Color would only mar his photographs, steal their reality. With the Ludlam, West and Lebowitz portraits, Hujar tapped into something that still looms large over our culture — our burning desire to know what the famous are like away from the spotlight. Morbidity pervades Candy Darling on Her Deathbed, published in the New York Post months after Darling died of lymphoma, caused by the same hormones that fueled her transition. She was an extremely glamorous actress, an Andy Warhol superstar, but the times were generally not ready for her and she was largely ignored by the mainstream. 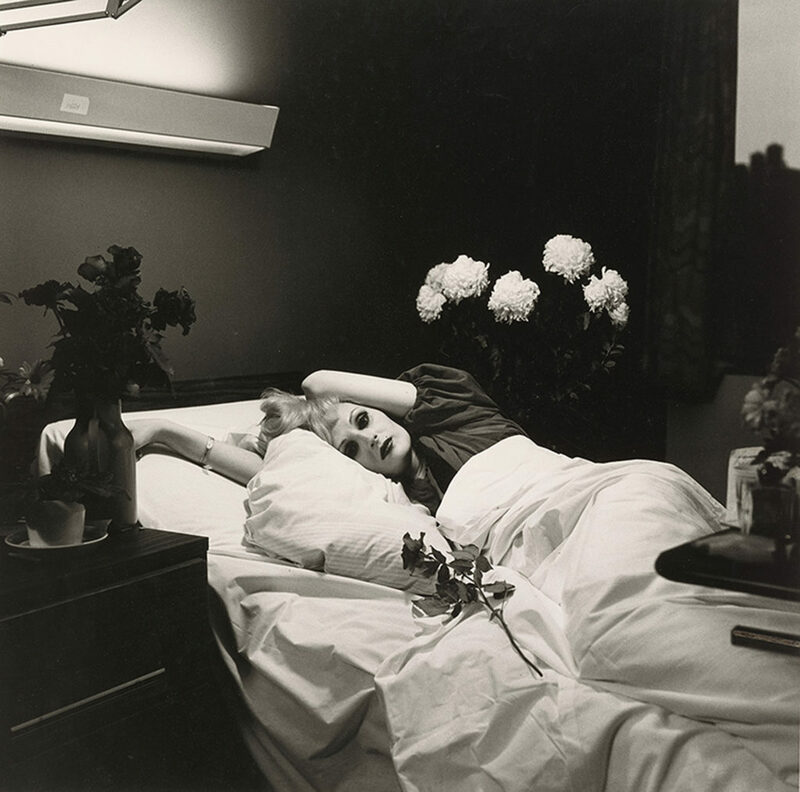 Candy Darling on her Deathbed, 1973, gelatin silver print, collection of Ronay and Richard Menschel. © Peter Hujar Archive, LLC, courtesy Pace/MacGill Gallery, New York and Fraenkel Gallery, San Francisco. 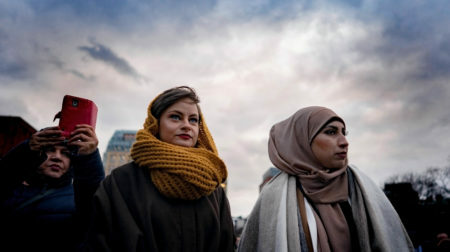 Now, some may not want to look at a photo of a woman dying, especially a young woman like Candy, yet those of us who are obsessed with her or with death wouldn’t dare look away, though what we are seeing is unclear. She has maybe just finished crying, possibly she’s defiant or perhaps she’s resigned to her fate. She seems to be on the verge of a smile, looking amused. She’ll be damned if she’ll let cancer steal her beauty. Flowers surround her as if she is already in a coffin. The room is dark reminding us of the ultimate, eternal darkness that awaits us all. Palermo Catacombs #11 is an early Hujar photo of a burial ground with what one guesses to be skeletons looking like they’re auditioning for a “Tales from the Darkside” episode. Girl in My Hallway is another shocking piece, with its young, maybe dead child or teen, who Hujar isn’t trying to help. It speaks volumes about the way New York was, the way residents became numb to urban decay. 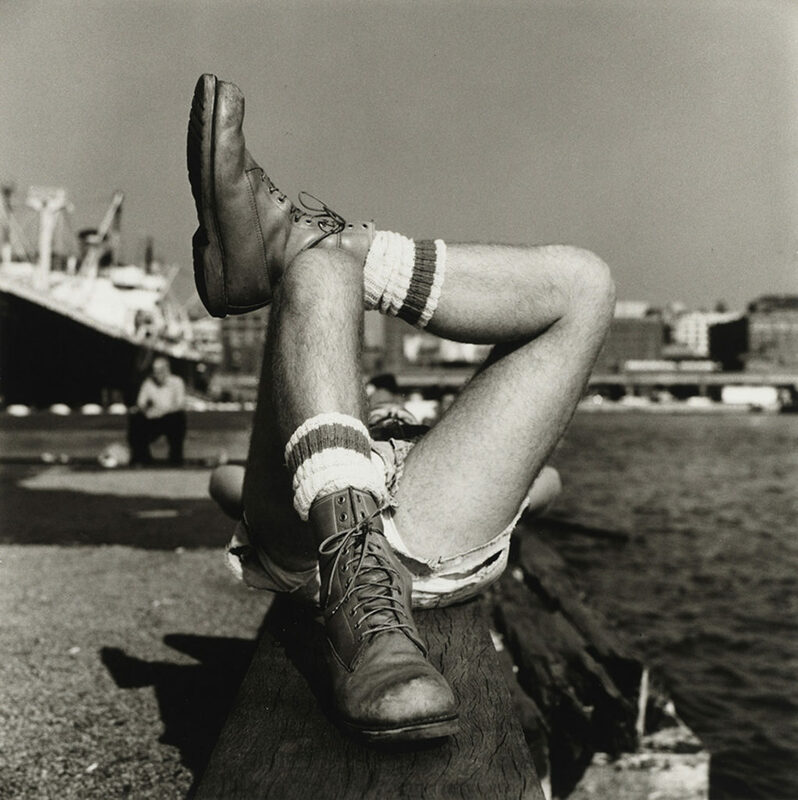 Christopher Street Pier (2), 1976, gelatin silver print, purchased on The Charina Endowment Fund, The Morgan Library & Museum. © Peter Hujar Archive, LLC, courtesy Pace/MacGill Gallery, New York and Fraenkel Gallery, San Francisco. Hujar was also a queer photographer, involved briefly with fellow artist David Wojnarowicz. And though he’s not primarily known for his work in this area, LGBTQ+ history buffs will be intrigued by the way he captured the early days of queer activism. 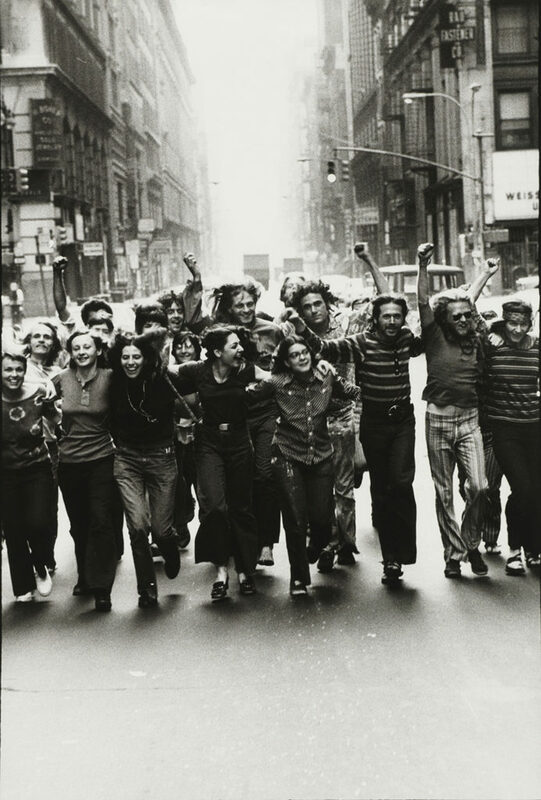 There is a feeling of joyfulness, of power, of a community united in Gay Liberation Front Poster Image. With Christopher Street Pier (2) we look between a man’s legs, which sounds a lot sexier than it is. He isn’t even naked, and the cruising ground is almost empty. But what the place stands for — and what this man stands for — is a wonderful, hard-won sexual freedom. The tragedy, of course, is that the freedom would be taken away. Like so many talented New Yorkers, including some he photographed, Hujar died of an AIDS-related cause. He left too soon but made good use of his time here. He slowed down the speed of life so those of us born too late could get a good view of a New York that will likely never be so exciting, so full of possibility, again. Gay Liberation Front Poster Image, 1969, gelatin silver print, purchased on The Charina Endowment Fund, The Morgan Library & Museum. © Peter Hujar Archive, LLC, courtesy Pace/MacGill Gallery, New York and Fraenkel Gallery, San Francisco. This is reader-supported news. Make a donation today! Photo (top): Gary Schneider in Contortion (2), 1979, gelatin silver print, purchased on The Charina Endowment Fund, The Morgan Library & Museum, 2013.108:1.79. 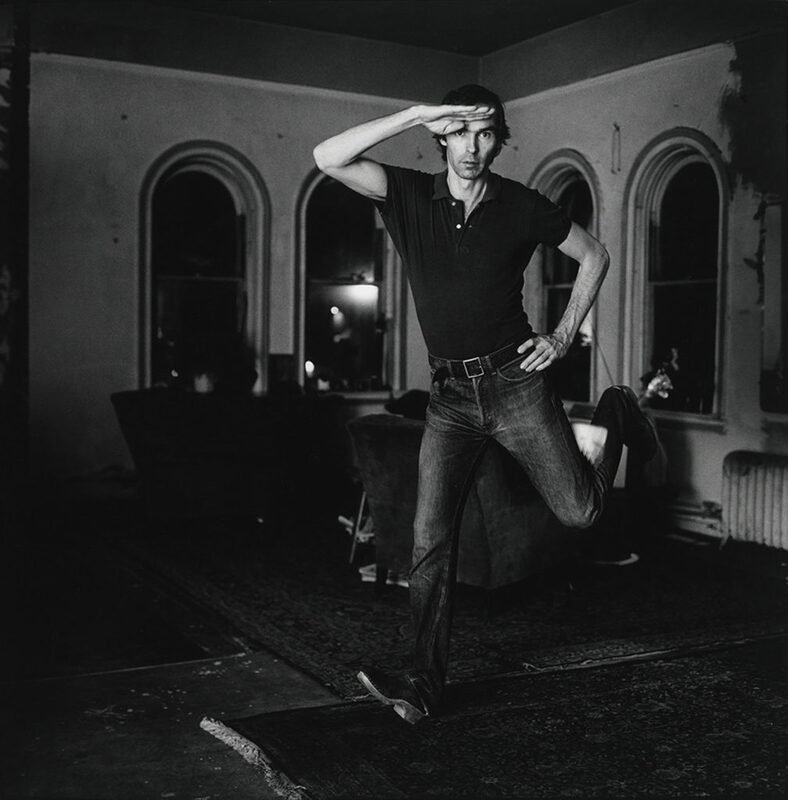 © Peter Hujar Archive, LLC, courtesy Pace/MacGill Gallery, New York and Fraenkel Gallery, San Francisco.